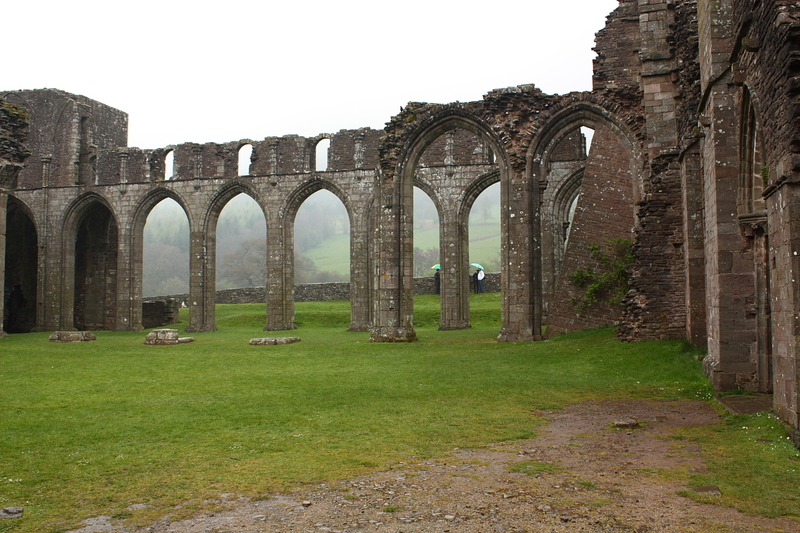 Llanthony Priory was one of the earliest houses of Augustinian canons to be founded in Britain, and is one of only a handful in Wales. It is chiefly famous today for its wild and beautiful setting, far up the Vale of Ewyas in the Black Mountains. 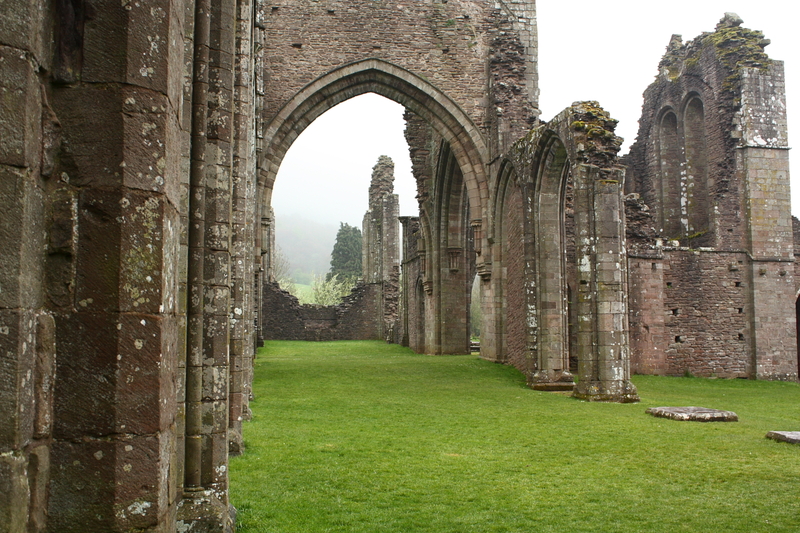 It was the priory's remoteness in the Welsh hills which was its undoing, however, making it vulnerable to attack. Giraldus Cambrensis described it, in the late 12th century, as being 'fixed amongst a barbarous people'. William de Lacy, a knight in the service of Hugh de Lacy, is said to have chosen the spot while out hunting, when he sheltered in a chapel there dedicated to St David. Very quickly a church was established, dedicated to John the Baptist, and it was reorganized as a priory in about 1118. Hugh de Lacy, who had assumed the patronage, endowed it with land, and it soon became famous, enjoyed royal patronage and received many visitors. There were 40 canons in residence, but in about 1135 the 'barbarous people' forced a retreat to Hereford and Gloucester. 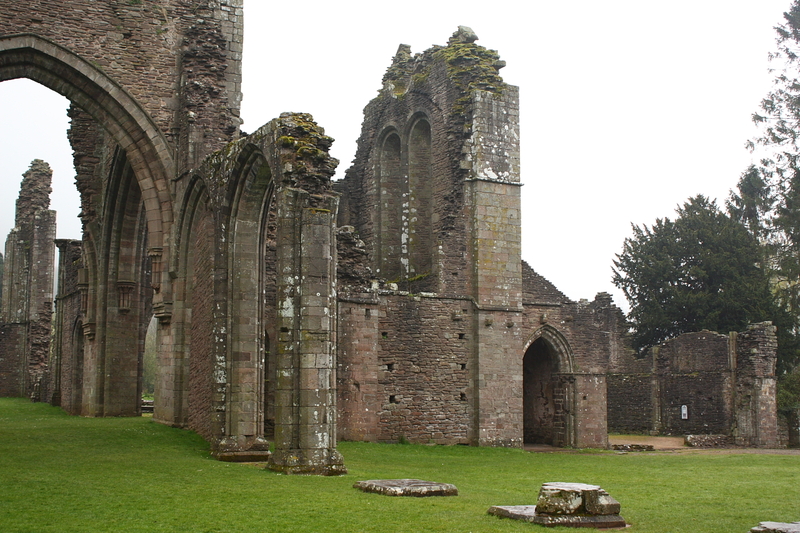 Of this first priory nothing remains. Peace and renewed endowment by the de Lacy family brought canons back from Gloucester and ushered in a great rebuilding phase. It is the remains of this phase that can be seen today. 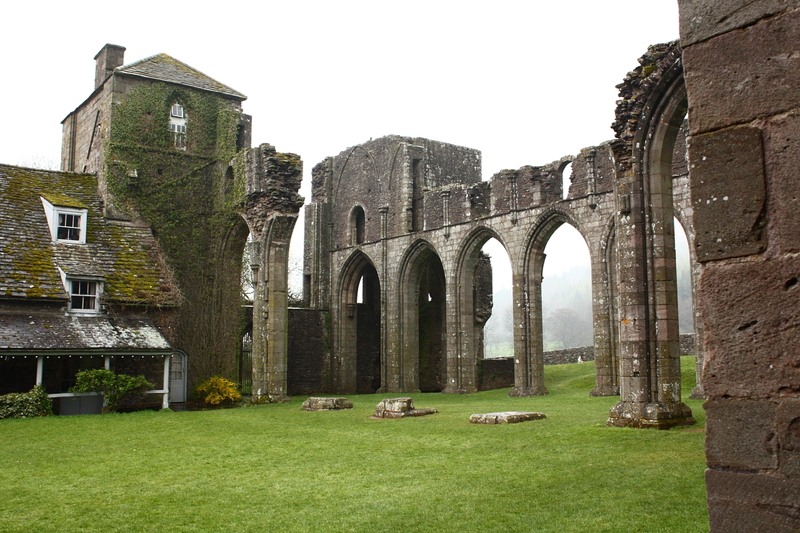 The priory's church, built between 1180 and 1230, was one of the great medieval buildings of Wales. It's plan was the standard cruciform one, with a massive crossing tower and two small towers at the west end. In style it is transitional, with a mixture of Norman round-headed arches and Gothic pointed ones. From the preponderance of round-headed arches at the east end and in the crossing it is surmised that building began in the late 12th century and progressed westwards. The size and remaining details of the church show that the builders were both wealthy and sophisticated. Eighteenth-century travelers in search of the picturesque were lucky enough to see the east and west window tracery still in place, and in 1803 Sir Richard Colt Hoare actually witnesses the great west window fall. It had three tall lancets to the present height of the towers, and above that three smaller ones. The crossing tower, whose west and south sides survive, originally had one more level. The round-headed windows belong to a passage in the wall, and the doorway above on the west side lead into the roof space of the nave. Recent excavation has produced evidence that there was a clock in the tower, probably of the late 14th century, and of a very early primitive and rare kind. It had no dials, but would have struck the hour. 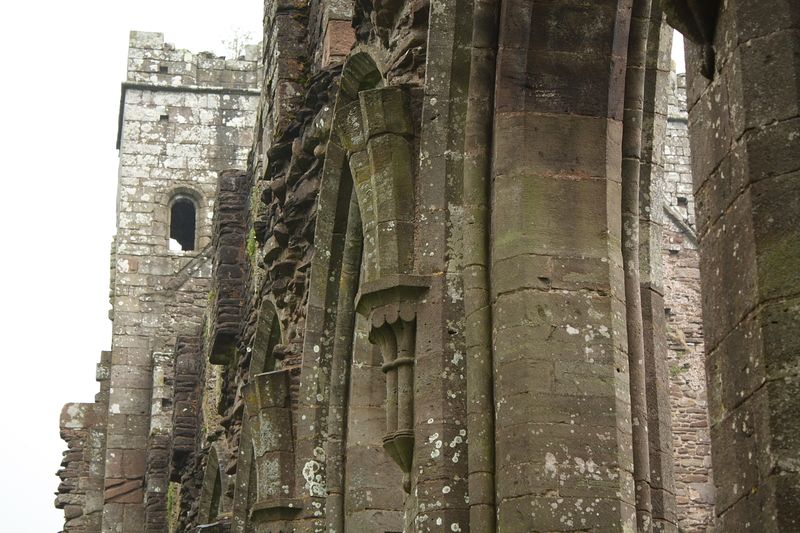 The north transept is more ruined than the south, whose south wall with its large window openings remains intact. Opening off the transepts, on their east sides, were chapels, now reduced to footings only, which were altered in the 14th century when the large arch was inserted in the south transept, and the north transept and its chapels were converted to domestic use. The main feature of the nave is the arcade of the north aisle (right). 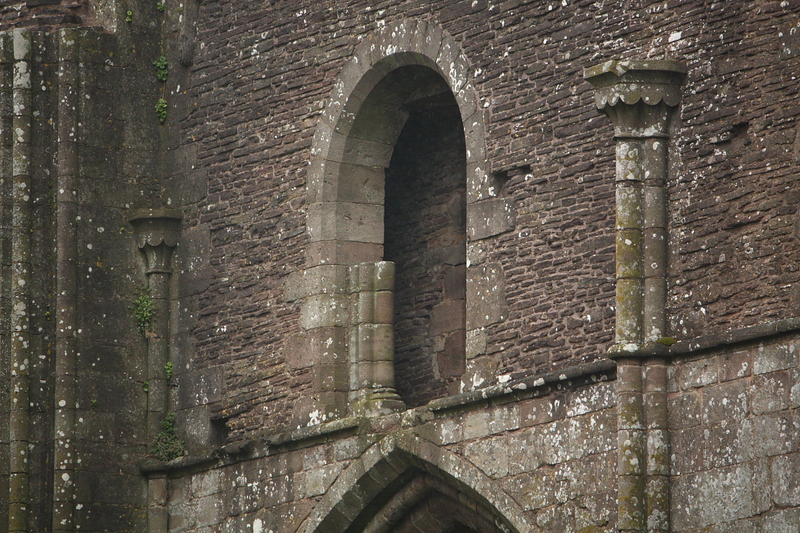 All eight bays survive, with a partly-ruined triforium over them of paired lancet windows in round-headed openings. These would have been inside the church; above where the clerestory windows, now gone, which would have given light from outside. The positions of the exterior walls of the nave can be made out on the south side by extending the broken edge at the east end, and on the north by following the drop in level. The roof-line can be clearly seen on the west wall of the crossing tower. The exterior of the west end of the church is perhaps its finest part, and gives the best idea of its original appearance. The main impression is of lightness and elegance. The large, simple arched openings of the ground floor provide the necessary weight to carry the round-headed arches and tall, thin blind lancets above. The whole is held together by the string courses and is perfectly balanced, even without its top story and great window. In each angle were spiral stairs, lit by slits. Little remains of the claustral buildings of the priory, and some have been much altered by conversion into a house and later hotel, a parish church and farm buildings. What remains there dates from the first quarter of the 13th century. To the south of the nave, where there is now an open lawn, were the cloisters. 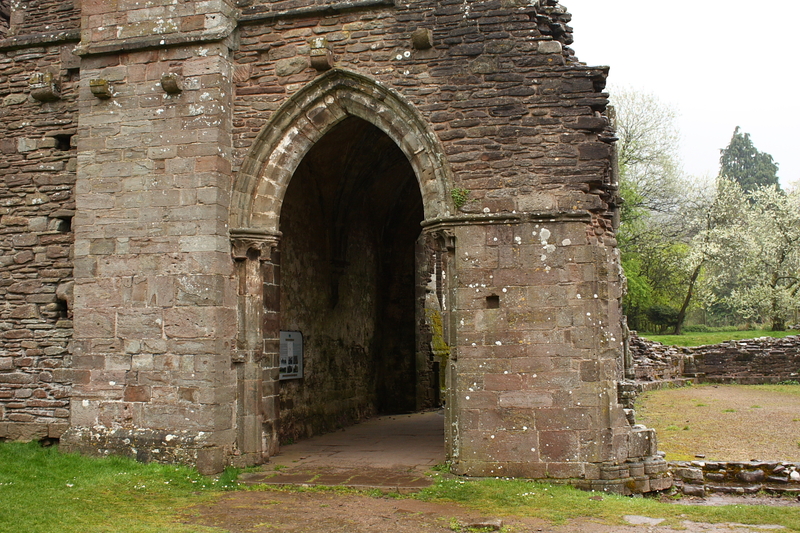 After the great rebuilding the fortunes of the abbey continued to see-saw, with most of the monks eventually retreating to Gloucester, especially after the devastation caused by Owain Glyndwr's rebellion at the beginning of the 15th century. By 1504 there were only four canons left. After the Dissolution the site was sold for about £160, and was left to decay.